Triggered with intelligent motion detection: Automatic gates trigger by motion detection sensors and apply logic to manage traffic at critical aisles and crossings. 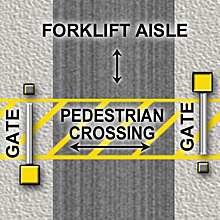 This gate system helps separate pedestrian and forklift traffic by alerting forklift operators when a pedestrian passes through the gate. A photo eye beam is broken when the pedestrian goes through the gate, triggering a flashing LED strobe light. This helps warn forklift operators that a pedestrian is in the traffic lane. This system uses a striker post outfitted with a reflective target. This system helps manage pedestrians who may cross the path of oncoming industrial vehicles by requiring the pedestrian to press a button in order to activate the gate system. Motion detectors scan for traffic in the aisle and trigger the gates to open only if the aisle is clear. 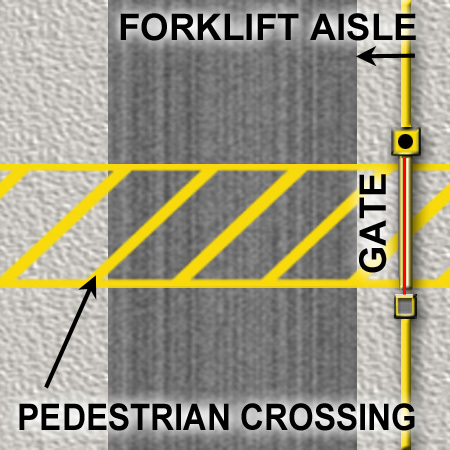 This gate system helps separate pedestrian and forklift traffic by scanning the forklift lane for traffic before opening the pedestrian gates. 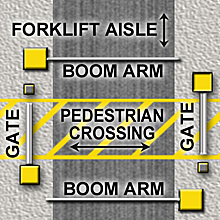 At the same time the pedestrian gates open, the forklift aisle boom arms lower to obstruct industrial vehicle traffic from travel while the pedestrian gates are open.Triggered by push button.